After proving to themselves that carrier operations were feasible for jet aircraft with the de Havilland Sea Vampire, the Navy formulated a specification for a fleet defence fighter. The RAF issued a similar requirement and de Havilland decided the requirements were so similar that a single aircraft could fulfil them both. While Gloster aircraft produced the GA.5 (later to become the Javelin), de Havilland produced the DH.110. The RAF were edging towards the Gloster aircraft but as an insurance, five DH.110s were contracted for, plus four for the Royal Navy. These four were quickly cancelled when the Navy decided that a simpler and cheaper option would be an improved version of the de Havilland Sea Venom (the standard Sea Venom was shortly to enter service). The five aircraft for the RAF were also reduced; down to two prototypes - the RAF was also looking at simpler and cheaper options. Gloster got their GA.5 into the air first, and with that, RAF interest in the DH.110 ended. However, de Havilland continued working on the prototypes. The first flew on the 26th of September 1951. A year later this was the aircraft that killed John Derry, his observer Tony Richards and 29 airshow-goers at Farnborough when the wing failed and the aircraft came apart during a rolling pull-up manouevre. After that, the remaining prototype was strengthened and redesigned slightly over the course of a year before trials continued. While the improved Sea Venom project was cancelled, the Navy had a change of mind and decided they were interested in the DH.110 after all. The second prototype, WG240, underwent carrier trials, and the Navy liked what they saw. Significant redesign went into the DH.110 to produce the DH.110 Mk.20X; a prototype for a production version that would be designated the FAW.20. Ten development aircraft were ordered in 1955, the first of which was the Mk.20X - a rush job with incomplete carrier modifications - e.g. no folding wings. This aircraft first flew on the 20th of June 1955. Trials with this aircraft went so well a further 35 airframes were ordered. At the time the forces had a standardised mark number scheme that gave naval variants of aircraft mark numbers from 20 upwards, so these early Sea Vixens were actually FAW.20s, not FAW.1s. The first full FAW.20 flew on the 20th of March 1957. While the initial specification had called for four Aden cannon as well as four Firestreak missiles, the decision was taken to remove the guns; following fashion no doubt. Unguided air-to-air rockets were fitted instead, in pop-out boxes. In November of 1957 the first FAW.1 (now that the numbering scheme had changed to number naval variants starting at 1) was delivered to 700 squadron, which formed a trials unit (700Y) and tested eight FAW.1s until the unit was re-comissioned as 892 squadron. The twin-boom arrangement gives a strong hint as to its Venom and Vampire ancestry; a layout the Navy was well used to operating in the guise of the Sea Vampire and Sea Venom. The side-by-side seating of the Sea Venom was kept on in an unusual form; the observer nestled in the fuselage below and to the right of the pilot. The observer's cockpit was known as the coal-hole because of the almost total lack of a view out of it, and it was not a popular arrangement. At the time, the FAW.1 was a very modern aircraft, matching nearly any possible enemy. 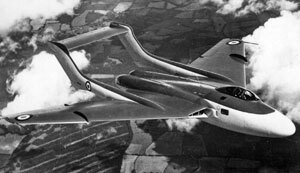 There was considerable interest from other countries, including NATO allies and Australia and de Havilland even had an improved mach 1.4+ version with thin wings on the drawing board but when the British government went loopy and decided that manned aircraft were obsolete (in the 1957 Defence White Paper), interest evaporated. The supersonic version had been cancelled the year before. 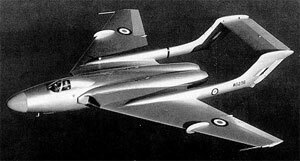 Meanwhile de Havilland worked on improvements to the design; a variant with increased fuel in wing tip tanks and an extended forward fuselage never got off the drawing board, but the idea of increasing the fuel load would later bear fruit. In 1963 the improved FAW.2 variant was coming into service; this had enlarged tail booms that extended forward of the wing leading edge (to give more room for ECM equipment in the top half of the extensions, and additional fuel in the tip and bottom halves), Red Top missile capability (which had limited all-aspect seeker heads instead of the tail-chase Firestreaks) and Bullpup air-to-ground missile capability. Other more minor improvements were made to FAW.2s as the variant entered service; most notably, the frame in the middle of the pilot's canopy was removed to improve visibility, and the observer's hatch became bulged with a frangible window. On FAW.1s and early FAW.2s the observer's hatch was flat with a tiny window in it. To leave the aircraft in an emergency, the hatch had to be jettisoned, and could not be ejected through. Around the same time improved ejector seats were fitted, the hatch cover was redesigned with a much larger perspex area and made frangible so the observer could eject through the hatch. These frangible hatches are bulged, and appear on most FAW.2s (e.g. XN685 as shown in the walkaround pictures section). Unfortunately if your seat failed to fire, this meant you had to try and escape through the clear part of the hatch, which was a very tight fit. In one sad case, an observer got stuck half way out and despite frantic efforts by his pilot to free him, ended up being killed. Another job for the Sea Vixen force arrived in January 1964, when Vixens from HMS Centaur flew air cover for marines landing to support government troops in Tanganyika. They also provided protection for RAF transports bringing supplies and equipment. With that crisis passed, and the navy's carrier force once again proving it's worth, the government went loopy once again. 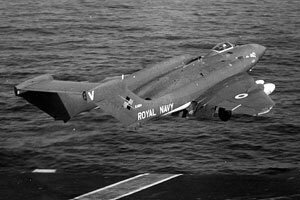 The 1966 Defence White Paper cancelled the navy's hoped-for new carrier CVA-01 (along with many other defence projects, including the RAF's highly advanced TSR.2 strike aircraft). The RAF had claimed they could reach any spot on the globe as easily as the navy's carrier force, and the Sea Vixen's days were now numbered. Ironically, the 'obsolete' carrier force was needed shortly afterward when Rhodesia declared independence; the navy mounted operations to try and prevent oil supplies from reaching the country. 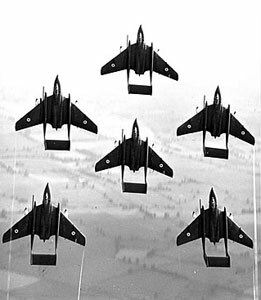 The RAF's Javelins suffered a number of embarrassing problems when they deployed to the area and proved completely ineffective. 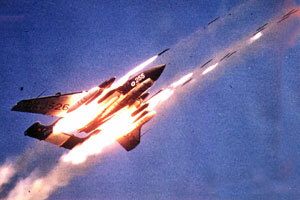 The Sea Vixen's final job was to oversee the withdrawal of British forces from Aden in 1967. Sea Vixens of 893 NAS were onboard HMS Victorious for her epic cruise of the far east from 1965 to 1967 and carried out this task in concert with the Buccaneers of 801 NAS, Gannets of 849A NAS and Wessexes of 814 NAS. On that particular cruise, Victorious steamed no less than 83,833 miles and used 75,033 tons of fuel oil! Flying any carrier aircraft was a dangerous job; the Sea Vixen was no different, and the unforgiving environment often meant that malfunctions turned into fatal accidents in the blink of an eye. Between 1960 and 1970 no fewer than 51 aircrew were killed - all casualties of a cold war that so many think was bloodless. The aircraft's tough construction saved it from destruction on many occasions, most famously when a deck landing gone wrong resulted in one Sea Vixen hitting several parked aircraft and other deck clutter before staggering back into the air and landing safely after diverting to a shore base - minus about 8 feet of the starboard wing! As a weapon of war the Sea Vixen was a mixed bag - it was a powerful and relatively quick (just supersonic) interceptor, but her missiles - particularly in early years - meant stern attacks were required on most targets (the expected hordes of Soviet bombers descending en masse to take on the carrier group). The observer had the tricky job of steering the radar and using his twin radar screens to figure out where the target was and direct the pilot to follow a course leading to interception. 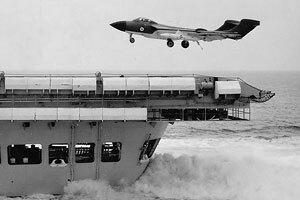 The radar's 'look down' performance was non-existent, so the aircraft had to be flying lower than the intended target - tricky if the target was coming in at low level, hugging the deck! The type's secondary task of ground attack swapped the crew's roles somewhat, with the pilot now handling much of the work and the observer reduced to calling out speed and altitude - particularly in dive attacks, when the pilot's attention was on the gunsight. The pilot's right thigh was within reach of the observer, and a jab with a suitably pointy object was a useful backup to ensure a dive was pulled out of in time! Sea Vixens were used by two display teams; Simon's Sircus (named after the team leader, Lt. Cdr. Simon Idiens) and Fred's Five (also named after their team leader; nicknamed Fred). While short-lived with only around 40 displays put on, Simon's Sircus was regarded by many as one of the best air display teams ever. 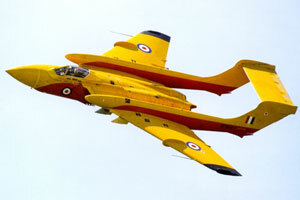 In 1972, the last Sea Vixen squadron was disbanded. This retirement was considered by many to be premature - the airframes had many years of life left to them; though their weapons systems were becoming increasingly outdated. The draw-down of the carrier force meant that there were no longer carriers to take all the Sea Vixens, and with Phantoms coming into service (after a farcical attempt to procure F-111 as a TSR.2 replacement), the naval operation of the last de Havilland fighter was ceased. After retirement from active service with the FAA, several Sea Vixens were modified to D.3 standard; these were originally to be drones and have missiles fired at them, but they were far too expensive for such a job, and ended up being used to train drone pilots in the techniques of flying an aircraft by remote control. The D.3 conversion process itself turned out to be more expensive than expected, so very few D.3 conversions went ahead (around five). An even smaller number of aircraft were converted to a target tug role, being called TT.2s as a result. Thankfully one of the D.3s survived to become a regular airshow performer - and the most complex civilian-operated type on the UK register (until Vulcan XH558 was returned to the air). None Two Microcell 2-inch rocket packs, four Firestreak IR AAMs, four 500 lb bombs. Four Firestreak or Red Top IR AAMs, four 500 lb bombs, four SNEB rocket pods, two Bullpup AGMs. 10,000 lb Rolls Royce Avon RA.28 turbojets (XF828) Two 11,250 lb Rolls Royce Avon Mk.208 turbojets.